Satisfy your hunger and need for more pokéballs. Are you a Pokémon trainer with an appetite? Then look no further. Yelp has just added a new filter that will allow you to find restaurants that are near Pokéstops. For those of you not familiar with the new hottest game, Pokémon Go, it uses a phone's GPS to detect where a player is on a map and has Pokémon appear around them. When a Pokémon appears, a player can swipe a Pokéball towards the Pokémon in hopes to catch it. The game also offers Pokéstops which are typically located at real-life gyms, churches, schools, police stations, etc. When visiting a Pokéstop, players can retrieve more Pokéballs, potions to revive injured Pokémon and other useful items for your backpack. That's where Yelp comes in. In addition to offering filters for price range and rating, you may now select the "PokéStop Nearby" filter if you are a hungry Pokémon Trainer in search of some good food and a resupply of Pokéballs. The filter is only available on desktop and mobile in the United States, Australia and New Zealand. Yelp's Associate Product Manager Will Cole has stated in a recent blog post that the Yelp team needs everyone's help in identifying which establishments are near Pokéstops. In order to identify a restaurant that is near a Pokéstop, simply check-in to that location on Yelp and answer a quick question. Yelp users have already identified thousands of Pokéstops. 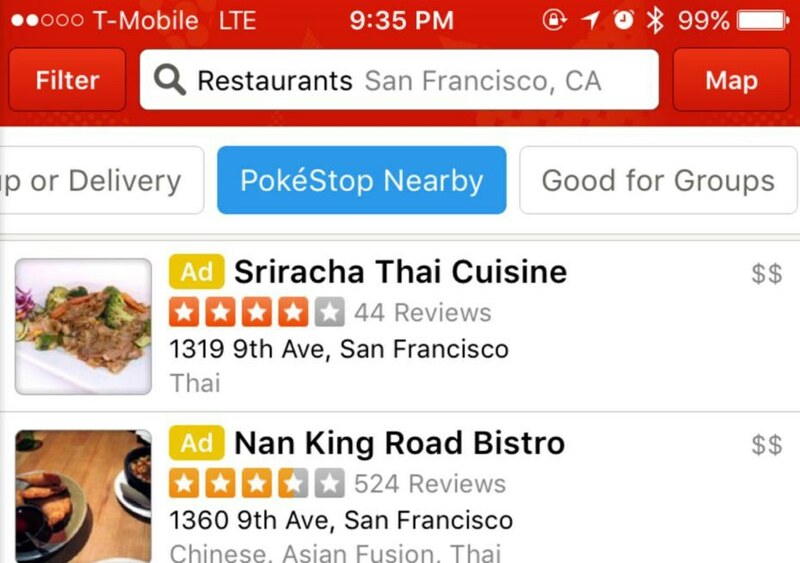 Yelp's new filter will allow restaurants near Pokéstops will begin to attain more business. More business leads to more revenue, and more revenue could potentially lead to restaurants advertising their close vicinity to a Pokéstop.